When I grow up I want to be just like Bruce Harvie. I want to live on a beautiful island in Puget Sound and learn all about various kinds of trees, so I can operate a business selling tonewoods to people who build beautiful musical instruments. I want to have a fantastic collection of such instruments, some of which were made from the very woods I sold to the builders. I want to become very good at playing those instruments and make friends with a lot of other talented musicians. 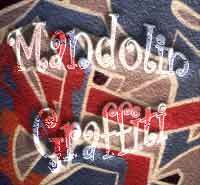 I want to know all about vintage microphones and recording gear and build my own studio so I can show off my instrument collection on my own CD, and call it Mandolin Graffiti. I want to save money by burning the CDs myself and putting all the artwork and liner notes online where people can download them, so I can sell the disc for only $10 instead of $15. I want to be a gifted composer/arranger, so I can fill the CD with exciting tunes and unusual groupings of instruments—mostly played by me—that really catch the ears of my audience. I want to name these tunes after graffiti that I've seen "tagged" onto chlorine-tank rail cars. Even if only a couple of cuts on the CD feature an electric mandolin, I want the music to be so refreshing that it's eminently worthy of a review on a Web site such as this one. But alas, Bruce has beaten me to every one of those goals, and the result is one of the most enjoyable, unusual CDs I've heard in a long time. Here the entire flock of mandolin-family instruments (minus the mandobass) is heard alongside not just guitars and fiddles, but a whole assortment of odd instruments, both foreign (angklung, kabosy, kalimba) and domestic (bass harmonica, jew's harp, chamberlin, pump organ, lap steel). Bruce's mandolins represent the absolute cream of the luthiery crop: Stephen Gilchrist, John Monteleone, Paul Duff, and Lawrence Smart, to name a few. Of course we're primarily interested in his John Sullivan electric mandolin and Fatdog electric mandocello, which appear on one track each. You might swear Bruce is playing electric on "White Lightning," the rockabilly number that opens the disc, but he isn't; it's his Monteleone acoustic. He plays it loud enough to overdrive the microphone and runs the results through a wah-wah pedal for a funky rhythm line. From these energetic beginnings, Bruce settles into a decidedly midtempo feel for the next four tunes, offering extended, laid-back solos on everything from the aforementioned Monteleone to a Duff mandocello, backed by the oddest pairings of instruments imaginable: Indonesian angklung and pump organ on "Pulse," lap steel and chamberlin on "daze," kabosies and bass harmonica on "Hub." Igor Stravinsky, Duke Ellington, George Martin—they all had a flair for unusual combinations of instruments, but Bruce just might be a match for any of them. Not content to merely overwhelm you with his creativity, he takes time on these tracks to develop fantastic melodies and build the musical texture layer by layer. On the next two numbers, the tempo picks up a bit. You might expect "Kentucky Waterfall" to be a bluegrass hornpipe, but it turns out instead to be a ragtime-flavored piece—actually, technically it's a "cakewalk." "Pet Rock," however, sounds pretty much like you'd expect, if indeed it's possible to know what to expect from Bruce. Here the Sullivan electric mandolin finally surfaces, pumped through a wah-wah pedal and a Vox amp and paired with some gutsy fiddling courtesy of Jon Parry. On "Slime," the closer, Bruce's Fatdog electric mandocello makes an appearance, playing a plaintive slide figure that struggles to be heard above a menacing E-Bowed bass line that's been souped up by recording it in an abandoned grain silo. This is a pretty disconcerting way to end a CD, but your patience will be rewarded with the hidden track: a honky-tonk-from-outer-space take on Bill Monroe's "Tennessee Blues" that should leave you with a smile. I hesitate to use the phrase "You've never heard anything like this before," because it's so seldom true. But in this case, Bruce just might have created the Sgt. Pepper's–meets–Le Sacre du Printemps of mandolin music. If you haven't already done so, I'd strongly recommend checking it out before he gets around to releasing the White Album–meets–Petrouchka of mandolin music.